!! !SPECIAL SALE - Solo Mounting Brackets now only $25.00!!! Fits 2013 - 17 models. 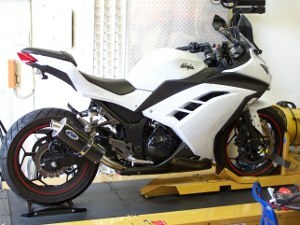 Area P exhaust systems for the new Ninja 300 model are the result of a highly focused R&D program. We started “clean-sheet with the design, as it carries little influence from the 250r model. Making power that is both linear and strong takes many prototypes and countless test hours to realize tangible results that you can actually feel. It is not easy to attain improvements on small displacement, high reving 4 strokes without thorough R&D programs. Area P puts in the required resources and efforts to get results. Combining with the new exhaust systems, is an extensive and continuing Fuel Injection mapping program; which is a requirement to attain maximum results. Our goals during R&D were a linear power-band right from the bottom to peak, along with direct throttle response that really connects to the rear wheel and your senses. You will feel it from 3000 rpm, all the way up to the soft limiter of 12500 rpm. Our new systems incorporate floating exhaust port flanges for ease of installation, large multi-stepped headpipes, true hand-built merge collector, large mid-pipe/S-bends, and our highly engineered, hand-crafted muffler assemblies for maximum tuned flow and smooth exhaust tones. Special lightweight 304 series stainless steel tubing is utilized throughout. Welded sections are meticulously fitted and assembled with hand-crafted Tig welding. Race inspired slip-fit, spring mount junctions are utilized at the head pipe to merge collector. 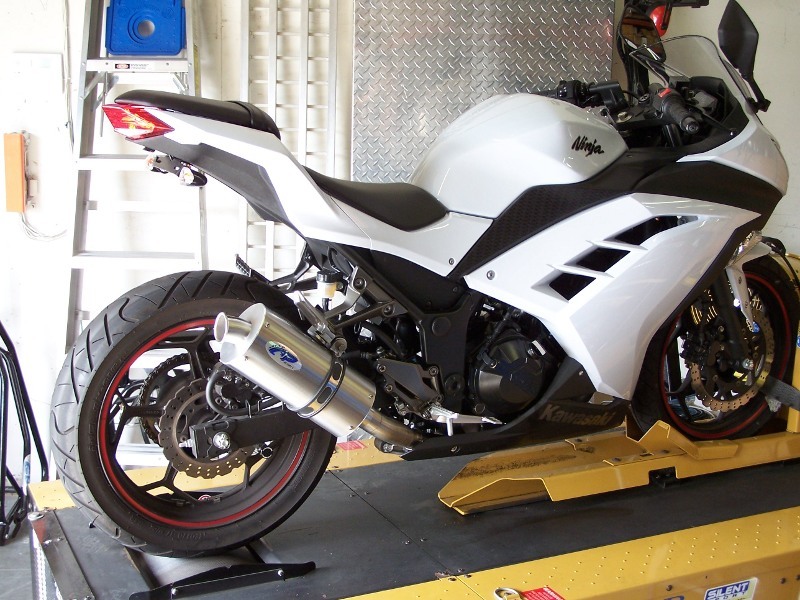 Mid-pipe, S-bend, and Muffler inlets are slotted and secured with high quality stainless steel T-bolt clamps that unitize the entire assembly into a secure solid structure, while still allowing full adjustability and easy installation. Muffler is secured with electro polished 304 series gusseted body clamp with insulated rubber extrusion for protection and dampening. A variety of mufflers are available in High Temp, Lightweight Carbon Fiber or 304 Series Stainless Steel. End Caps are CNC’d from solid billet aluminum material for a perfect precise fit with new Flat Conical Billet End Cap. Custom spec high percentage stainless steel cores are utilized, and then packed with Area P “High-Loft” muffler packing for superior heat insulation and attenuation of sound pressure waves. We take no short-cuts - All hardware is 304 series stainless steel for strength and lasting durability. Area P Custom Exhaust Port Gaskets are included with all systems at no extra charge! *11/24/14 - All full systems now come standard with our new Flat Conical Billet End Cap. To view our new Flat Conical Billet End Cap, go to our "Custom & Univeral" web page. *If you have a 2015 - 2017 model with the OEM O2 Sensor in the headpipe, you will need to contact Dynojet for the "O2 Optimzer" kit which will allow you to remove it and prevent the FI light from coming on at the dash. ULTRA HIGH MOUNT - For those who want the ultimate in clean styling and aggressive stance – this is your choice! Features a strong and very cleanly engineered mounting system that integrates perfectly with the sub-frame. 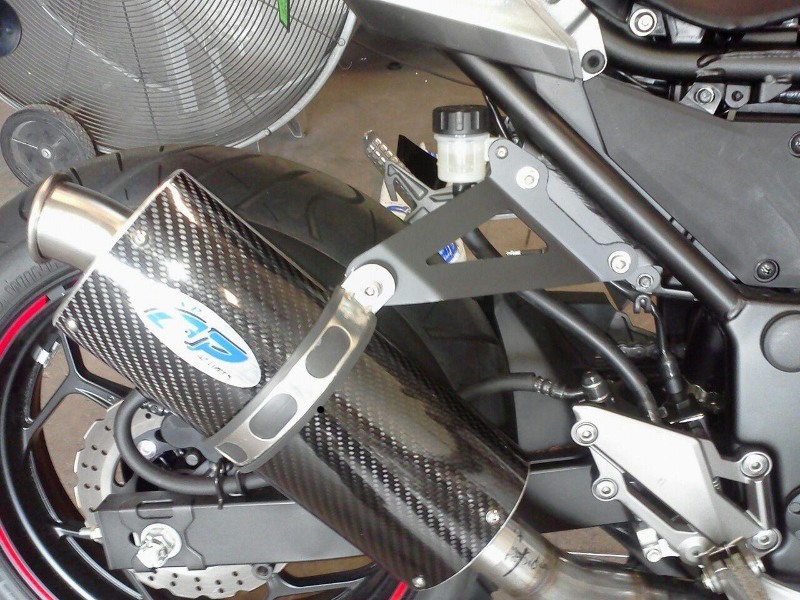 Choice of our standard length Carbon Fiber or Stainless Steel Muffler. Emits a deep exhaust tone with our special high percentage stainless steel perforated core and high-loft Area P muffler packing material. We have seen over 40+ hp & 19 ft lbs tq with this system on the Dyno! Please note - The Ultra High Mount requires passenger pegs be removed,. If you retain the oem fender/turn signals, the turn signals require relocation. 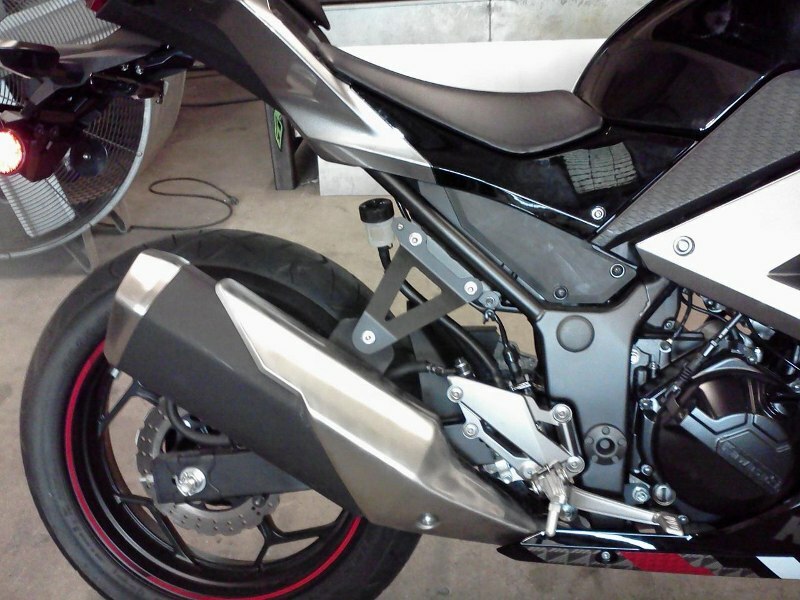 We utilized the Targa Accessories Fender Eliminator Kit & turn signals with excellent results (pictured). STANDARD MOUNT - For those who want to retain their passenger pegs and keep that mid-mount type styling. Mounts to OEM passenger peg location. 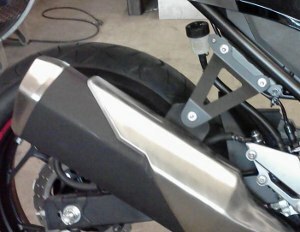 Optional “Solo” mounting bracket available as well for those who would like to remove their passenger pegs. Available with our Standard or Long Quiet Core Muffler, in Carbon Fiber or Stainless Steel. Refer to the sound data section and/or sound bytes for the differences in exhaust tone. Standard Mount Systems retains passenger pegs. 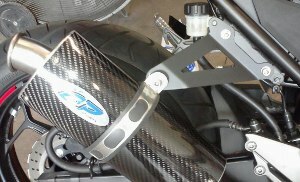 ACCESSORY "SOLO" MOUNTING BRACKETS Specifically designed for Area P Standard Mount Systems and/or the OEM Muffler Systems. Simple bolt-on installation. 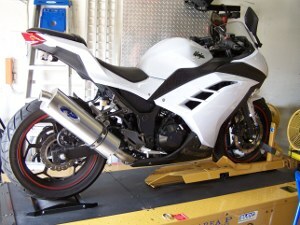 May fit other brands of exhaust as well that utilize a sliding muffler body clamp design. Allows you to remove the passenger pegs for a cleaner style and saves weight. Precisely cut by CNC Laser and Formed for strength. Two bends are incorporated starting at both the top and bottom. This gradual bending technique results in less stress on the material and superior vibration damping (similar to "tuned flex"). We utilize thicker material in these brackets for added strength and less movement. Black Satin Powder Coat finish. New stainless steel mounting hardware included. Accessory solo mounting brackers are optional, not required. “Slanted A” Bracket moves the muffler mounting point further back for better support and styling (especially if combined with the Long Quiet Core Muffler). Fits all Area P Systems. Possibly other brands as well. Includes mounting hardware. “Straight A” Bracket is specifically designed for the OEM Muffler/System and includes special spacer (required) in mounting hardware. 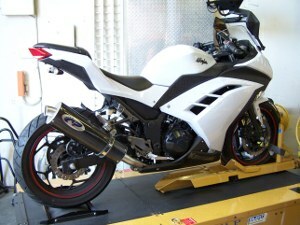 May fit other exhaust brands as well that utilize the OEM mounting points and spacing. AREA P/FUEL MOTO - FI MICRO PROGRAMMER The Fuel Moto Micro Tuner features a powerful range of fuel adjustments, utilizing proprietary logic. The new Micro Programmers are available exclusively from Area P and Fuel Moto only. We’ve had a long-term relationship with Fuel Moto and asked for these units to be specifically developed for the Ninja 300. The unit is easy to install and utilizes OEM type connectors (plug & play). Fuel Moto is the leading expert in our industry for FI management. We have partnered with them because they have a similar technical and customer support background to Area P. A variety of Maps is currently available and can be pre-programmed/loaded for you, based on your mods. We also have maps for use with the OEM exhaust system that yield excellent improvements in throttle response and power. Additional Map databases will be continually under development for most combinations of tune, elevation, temperature and humidity conditions. We have an extensive map support system and warranty that sets a new industry standard (the Micro Programmer comes with a two year warranty). 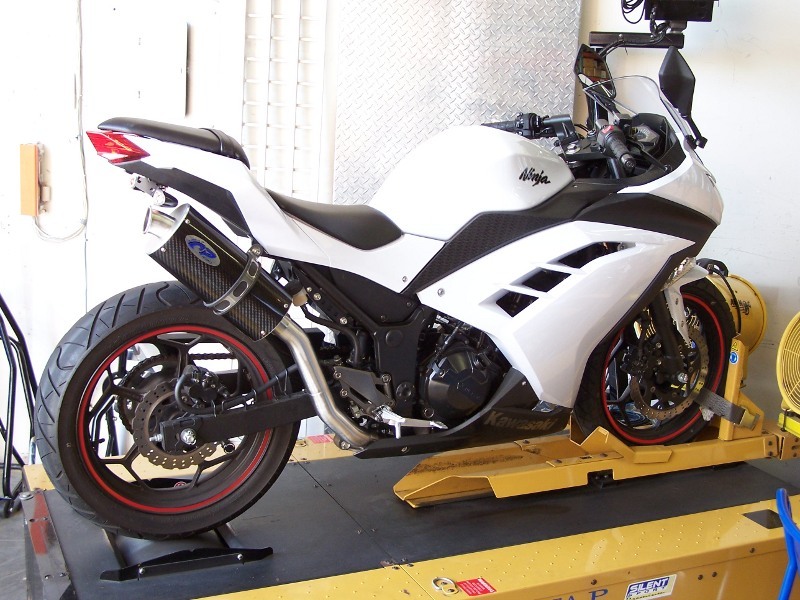 For those who may not wish to experiment with the Tuning features included on the CD in the kit, you can simply contact us and explain what your particular bike is doing or not doing within your riding conditions and/or state-of-tune. We can then make changes to your specific map and e-mail it to you as part of our support system. Or, you can take advantage of our live “Offsite Tuning Support”. In simple terms, we can access/log onto to your computer that you have the map up on, and make adjustments in real time! 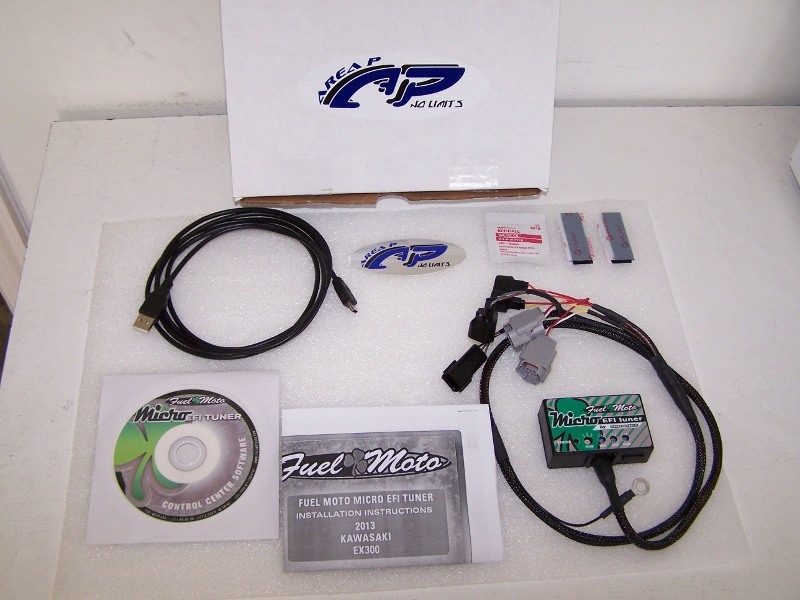 This particular feature will be done through Fuel Moto and support will cover all Area P and Fuel Moto maps with purchase of the Micro Programmer. 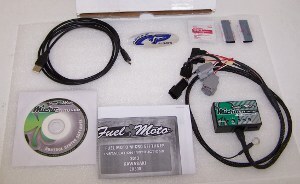 Fuel Moto FI Micro Programmer is for closed course competition/racing use only and is not EPA and/or C.A.R.B emissions compliant. Lifetime Map support when purchased through Area P to the original owner/purchaser. 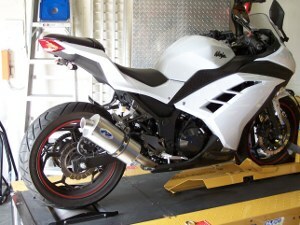 Up to 9 lbs depending on system configuration/muffler choice. All system choices for the new 300 Ninja produce their own unique exhaust tones based on overall system and muffler lengths, along with core diameters. Area P systems produce a deep, low frequency exhaust tone that are unique from other systems. We attain this by utilizing a specially designed high percentage stainless steel perforated core, muffler volume and shape, and packing them exclusively with our new Area P high-loft muffler packing material. All gear sound byte links are also provided below. 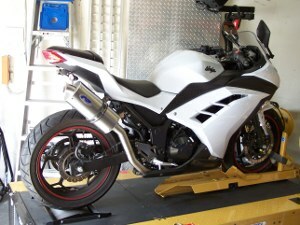 Our test bike was a 2013 model with 2321 miles on it. All Area P systems were tested with intake snorkel removed K&N panel filter, and FI Micro Tuner and mapping. As noted, all systems when properly mapped, attained very similar increases starting at 3250 rpm and at 11250 – 11750 rpm, and only a few tenths fall off at the soft limiter of 12500 peak. The OEM system stops making power at 10750 rpm and starts falling off rapidly (almost 2 horsepower) at the soft limiter. So essentially, no reason to rev it over 10750 rpm. Especially when comparing power at the soft limiter of 12500; Area P systems have almost a 6 horsepower advantage (+ 15%) over the OEM System and we've seen over 7 hp on other test bikes! On a small displacement 4 stroke, that is a huge increase. These are the kinds of increases that can be felt without looking at the Dyno charts. The Standard Mount System/Long Quiet Core Muffler has the added benefit of being the quietest of the systems, and also having one of the smoothest, strongest power-bands overall. The Standard Mount System/Standard Muffler and Ultra High Mount System/Standard Muffler are very similar to each other and hit noticeably harder in the 7000 – 9000 rpm area as they really start to make power. R&D Mapping at Fuel Moto facility resulted in over 40.24 hp and over 19 ft lbs tq with the airbox removed, K&N Filter Pod installed, along with our FI Micro Programmer and Mapping. Comparing Ultra High Mount System and Standard Mount System with stock baseline run.